*This is part 5 and the final installment of a series, The Ultimate ABCs of Programmatic Advertising. See all other parts of this series: part 1, part 2, part 3, and part 4. We launched this series as an aid for every digital marketer out there who has ever been confused, annoyed, or even a bit frustrated with all the programmatic advertising jargon out there. Today, we breakdown everything from T to Z.
historical data web browsing data to predict where users will be in the future, and what they’ll click on to serve the most relevant ads to them. This is where First-Party data, especially data collected by publishers, is therefore an important factor in accurate behavioural targeting. Contextual targeting is based on identifying and understanding the content that frames an ad placement to serve the most contextually relevant ads. This is done largely by scraping keywords and allows advertisers to, for example, run ads for a new car offer on a web page featuring an automotive article. Do I have to define this? This is pretty straight forward. A Unique User is pretty much what the term implies: the measurement of an individual web visitor and their behaviour. Unless you’re using a single sign-on (like Facebook), one person can have multiple unique user footprints if they use more than one device. UU is the basis of how web traffic is measured. 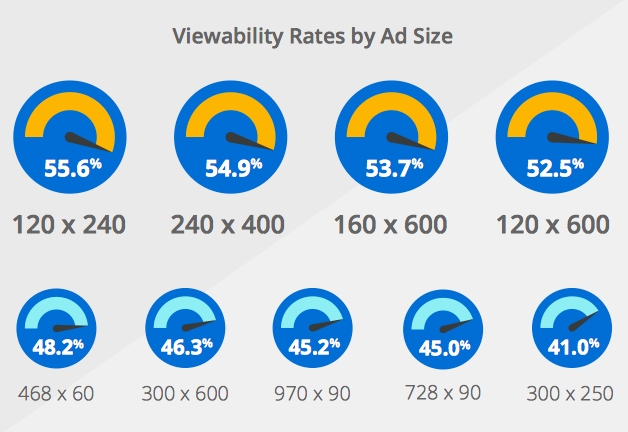 Viewability rates by ad size according to Ad Exchanger. Viewability is a digital marketing metric that is quickly becoming a standard in the industry. It refers to the tracking of impressions that are actually seen by users, not just impressions that are served. For example, if an ad placement is lower on a site, but a user doesn’t scroll all the way to the bottom of the page and therefore doesn’t see the ad, then that is not a viewable ad placement. The IAB has set out regulations that dictate a minimum of 50% of the ad has to be displayed on screen for at least one second to be considered viewed. The ratio of bids in an auction to those that are won. According to Digiday, Win Rate is used as a metric in the programmatic world for technological efficiency. You may have heard of the term yield management in the context of digital marketing before. What does it mean? Yield management is a challenge mainly for publishers. Demand for any given website’s inventory fluctuates and does not necessarily consistently fill 100% at the best rate. Yield management has the aim of filling as much inventory as possible at the highest rate to maximize the publisher’s ROI. Yield management officers determine which buyers publishers should partner with, how much inventory they should get, and which buying channels are work best. It’s not an easy job: for digital yield management strategists, we’re talking about striking the right balance between programmatic sales, direct, and indirect sales. Keep following ClearPier’s blog for everything you need to know on Programmatic and Digital Advertising. Remember to sign up for our monthly newsletter, and don’t forget to follow us on social media!